A professional level portable microphone mixer is not part of every audio pro’s field gear. But to get consistent audio from a range of microphones under a range of tough conditions, a portable mixer is a must-have tool. Many sound operators on small crews carry only a boom microphone with a package of wireless lav mics on the side. In most situations, this minimalist rig works for them. But when confronted with a challenge, a battery-operated portable audio mixer is the centerpiece component that separates the best sound operators from the rest of the pack. Even on the best days, getting good quality audio on location is a challenge. Depending on the camera being used, audio is often short-changed due to inherent limitations with the gear itself. Many DSLRs have poor audio control, and, most have only one or two channels at best. Some camcorders are hardly better. To handle more inputs, a mixer is essential. I don’t mean a cheap, no frills mixer — which can be more trouble than it’s worth. Like most audio gear, field mixers come with a wide range of quality and prices. It’s an old cliché, but true: You get what you pay for. Certainly, the mixer’s key function is to expand the number of channels. But there are major reasons for the price differences. Sadly, some people keep having to learn about these differences after blowing the sound on important jobs. An important reason to spend more money on an audio mixer are top quality microphone preamps. They are much quieter, have greater bandwidth and higher input level gain. Up until a couple of years ago, high-end mixers from companies like Sound Devices, Zaxcom or Aaton Digital were the only meaningful choice for working pros. Then, in 2015, Zoom came out with its F8 eight-channel mixer for $1,000. It began a new era of cost-effective, high-end mixers. The F8 mic preamps are quiet and have 75 dB of gain on each channel, giving them enough level to handle dynamic or ribbon mics. It doesn’t measure up to the very top end, but many mixers have found it is good enough considering the price. Since then, Sound Devices has introduced a new line of MixPre devices with very good mic preamps beginning at $650.00. I say this because it is no longer so costly to purchase a pro quality mixer. The cost barrier has been broken. Most models have from three to six inputs, excellent preamps and a full line of sought-after features. Users need to determine how many channels are needed. This usually depends on the type of programming being recorded. It is also important to consider whether or not handling line level signals is needed and if 48-volt phantom power on each channel is essential. Know in advance what kind of microphones will be used with the mixer. Most traditional mixers are optimized for condenser mics, either self-powered or phantom powered from the mixer. Dynamic and ribbon mics have lower output levels and less than premium preamps can get too noisy when trying to use them. In recent times, however, newer preamp designs have gotten much cleaner and the input gain higher. It is still important to always check these specs. Some audio mixers have a master fader to control the outgoing level of the signal to the camera or recording device. With such faders, determining unity gain is important. Determine this gain level, set it and leave it. Monitoring sound from a mixer is very important. Configurations for monitoring varies from mixer to mixer, but reading the level through the meter is universal. Circular analog VU meters have mostly been replaced with arrays of LED lights or a bright, colored linear readout like the one Sound Devices debuted on its new MixPre line. Be sure to learn how the metering works for your mixer and understand what you are looking at. Working with the meter correctly is critical. Analog signals can climb over zero decibels without a major problem, but digital recorders clip above zero. When this happens, you are in trouble. There is no leeway on clipping. Always get the strongest signal without clipping the audio. This is very basic stuff. Many high-quality mixers have a good limiter to help protect against clipping. It can be set to suppress audio above certain levels. Limiters are another area where the cost of the mixer often determines quality. Good limiters are expensive and less noticeable on high-end mixers. Another tool that can be helpful are high pass and low cut filters. These reduce the volume level of the background without affecting the frequencies of the dialog being recorded. Most presets are 20, 80 and 150 hertz. Using 20 hertz is OK, but not particularly effective with noisy backgrounds. It’s better to use 80 hertz on a male voice and 150 hertz on a female voice. Experiment with the filters and check each one before recording. When the recorder is set to record, turn on the mixer’s tone oscillator and send the signal to the camera or recorder through the mixer’s outputs. Adjust the level on the recorder until it’s at zero. Now the meters on your mixer should match the levels being recorded. If your mixer doesn’t have a tone oscillator, it becomes a bit more difficult for set-up. Most modern field mixers have the ability to monitor through headphones either the sound coming into the mixer or the output from the recording device. This is usually called monitor return. 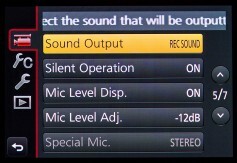 With this feature, users can adjust the monitor output level of the recording device until the return signal matches the mixer’s signal volume. It offers confidence that the signal being sent to the camera is good. Some DSLR cameras have no adjustable manual audio controls. If this is the case, look for a switch that says disable “AGC,” or automatic gain control. Send a 20 Hz tone via one of the channels to reduce the effect of AGC. You’ll have to filter out the tone in post, but it will sound better than having the AGC pump the audio in the feed. Today, there are many ways to get audio into a camcorder or DSLR. Sometimes it’s easiest to do double system sound and go around the camera entirely. In this case, send your audio to a flash card recorder and use syncing software in the video editor or third party software like Red Giant’s PluralEyes 4 to lock the audio to picture. Having a premium quality audio mixer offers great flexibility to record high quality audio for video. It is a solid tool for all audio professionals and now more affordable than ever.